FLt Otakar Hruby DFC - Letci Plumlov z.s. A RAF pilot Otakar Hruby was born to a family of patriots and his father was a foreman at the Schnabel Textile Works. Otakar attended a junior high school at Nova Paka and from his childhood was a member of the local Sokol Youth Sports Club. He was schooled further at the Mlada Boleslav Car Maker´s Vocational School. In 1932 Otakar volunteered for a Specialist at the Prostejov Aeronautical Academy. Having graduated from this school, he was assigned to No 82 Flight of No 5 Fighter reg stationed at Prague. Serving there Otakar was sent for a NCO course and underwent various airmen ones later. He served with Nos 5-6 Air Regiments at Hradec Kralove and Brno respectively. On March 15, 1939 Otakar was at No 4 Air Reg at the town of Pardubice. From Prague he left for Moravia where – accompanied by Stanislav Fejfar - they crossed the Polish border. Having reported to the Czech Consulate in the town of Krakow, Otakar left for the port of Gdynia, He embarked the Sobieki liner here heading for Bologne, France. Via Paris he went by train to Marseille, where presented to the Foreign Legion in the St. Jean Fort was. Otakar sailed to Oran and arrived at the Sidi-bel-Abbes Foreign Legion Training Camp to undergo his infantery drill. When WWII broke out Otakar was assigned to the Tunis air base and afterwards to the one of La Senia at Oran. Assigned to No ERC 572 unit, Otakar familiarized himself with French aircraft. At the rank of Corporal he was posted to No I/10 Group de Chasse in Tunis as a field pilot. Otakar made several ops with this unit and was released from that following the capitulation of France. He got to Liverpool, England via Casablanca and Gibraltar. Having been tented at Cholmondeley Park for a short time Otakar moved to the Cz RAF Cosford. On July 30 he signed for the RAFVR as a AC2. As a fighter pilot he was posted to No 6 Sutton Bridge SFTS Sgt late Sep at the rank of Sgt. He underwent his conversion to British aircraft here. 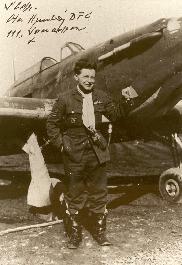 On Oct 19, 1940 Otakar Hruby was assigned to No 111 British Fighter Sqn statione dat Dyce, Scotland. He took part in the last phase of BoB. He opened his score sheet on Feb 21, 1941, doing damage to a Junkers bomber about sixty five kms East of Aberdeen. In March Otakar was promoted to F/Sgt and to the Czech Air Force rank of F/Sgt/Ret/. Four months later he was awarded the Czech Medal for Valour. During the following months Otakar downed and damaged several E/As. He was awarded the Cz Military Cross 1939 and promoted to a pilot officer/Ret/ of the Cz Air Force. On Feb 23, 1924 was Otakar Hruby commisioned as a P/O and in May he was awarded a Bar to his Military Cross. Otakar was posted to No 313 Sqn stationed at Fairlop. Completing his first tour of duty he became a flying instructor at No 57 OTU, Hawarden. In December Otakar resumed his operational flying as a F/O assigned to No 310 Fighter Sqn, Exeter. In 1943 a bar to the Cz Medal for Valour was awarded to Otakar. He was appointed the second in command of a No 313 Sqn´s Flight, promoted to F/O/Ret/ of Cz Air Force. Otakar was promoted to the rank of F/Lt on Feb 23. He served with No 310 Sqn until June 1944. Otakar was posted to Cz RAF Cosford Depot. After a short illness he was posted to No 17 /P/ AFU, where he familiarized himself with flying multi-engine aircraft. He was awarded a DFC for his gallantry and airmanship by A/C/M Sir Roderick Hill. Undergoing his conversion to twin-engine Mosquito NF Mk XII fighter planes, Otakar Hruby was seriously injured in March 1945. He was taken to hospital. 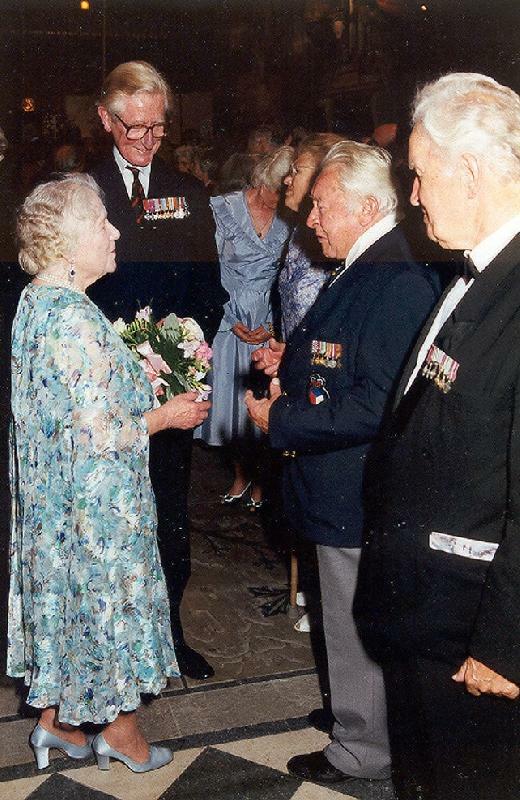 During his convalescence Otakar was assigned to Cz RAF Cosford Depot, promoted to the Cz rank of F/O/Ret/ and awarded the second bar Cz Military Cross. Otakar Hruby made two hundred and eighteen ops over the hostile territory, attacked enemy vessels eg Prinz Eugene, Scharnhorst and Gneisenau, in 1943 escorted four cruisers with His Majesty to Scapa Flow, took part as in the Jubillee as the Overlord operations. 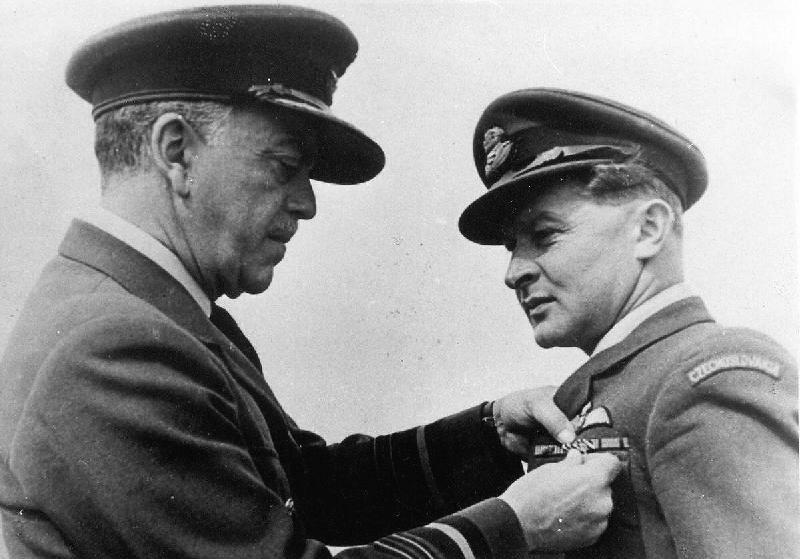 He was awarded also the 1939-45 Medal Star with BoB Clasp, Air Crew Europe Star with Atlantic Clasp and the Croix de Guerre avec Palme War Medal. 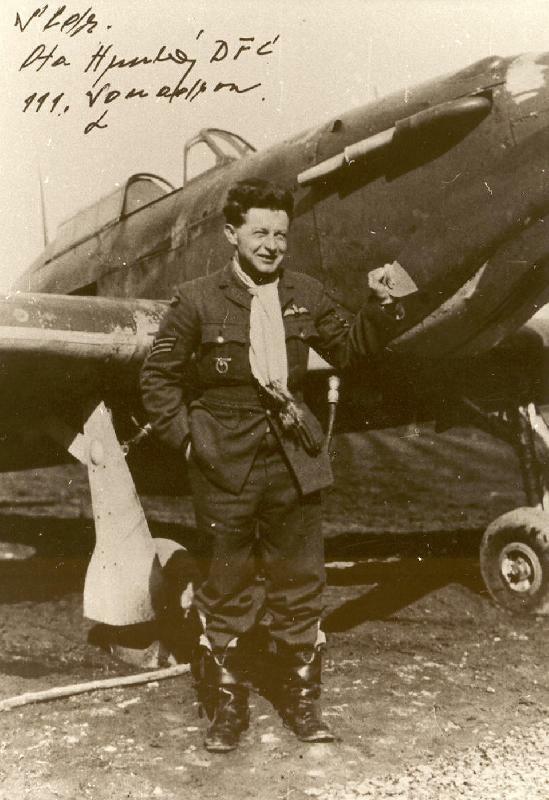 Otakar Hruby returned to Czechoslovakia on Sep 26, 1945, where he was assigned to No 121 Air Division at the Prague-Kbely air base as a Flight Commander. Due to a great demand in test pilots in the Czechoslovak AF he was posted to the group of career officers. He was awarded his third Bar to the Cz Military Cross and the Cz Merit Medal 1st Class. From Aug 1946 to Feb 1949 was Otakar Hruby a test pilot of commisioned aircraft at the Prague Letnany Aeronatical Testing Establishment. He was told to be dismissed from the Forces, because there was no post for him within the MoD. Three jobs were offered to him after a month in a print works, labour co-operative farm and the Roads and Rails Construction Co. Otakar returned to Nova Paka, offered menial jobs only, so he accepted the one of a joiner labour hand in his father-in-law´s company. On Jan 11, 1950 was Otakar Hruby detained by the State Police at his workplace and taken to Prague to be interrogated there. Later he was sent to the Labour Camp of Mirov for two years as a person ´avoiding working´. By a Local Council´s resolution he was demoted to soldier on Aug 16, 1950. He came home from the Labour Camp owing some money for his political ´indoctrination´. Otakar started working as a driver at a Noiva Paka Brewery, later he worked as an ironware store operator for the SS and Z company at Nova Paka. Though a retiree he worked till his 70 at the local Velveta spinning mill. On May 9, 1965 a Czechoslovak Memory Medal ´Twenty years of Liberation of the Czechoslovak Socialist Republic´ was awarded to Otakar Hruby. He was partly rehabilitated on Sep 17, 1969 and promoted to Lt-Col Ret. Post 1989 was Otakar fully rehabilitated, promoted to Col,, awarded the Czechoslovak People Army´s Medal 1st Class and a title of Merited Military Airman of the Czechoslovak Federative Republic. In 1990 he took part in a reunion of the RAF Ex-Servicemen in UK and chosen to be introduced to Queen Mother at a reception. Otakar Hruby was awarded the Milan Rastislav Stefanik Order by the President Vaclav Havel at Prague Castle in May 1991. Suffering from a fatal illness, he passed away in May 1993. Otakar was awarded the Cz Military Cross 1939+four Bars, the Medal for Valour+two Bars, the Cz Merit Medal 1st Class, the Cz Foreign Army Memory Medal with France and UK Clasps, the Croix de Guerre, the DFC, the 1939-1945 Star, the Air Crew Europe Star, the Atlantic Star, the Defence Medal and the War Medal. At a BoB 50 Reception at London Guildhall on Jul 12, 1990. L to R : Queen Mother, A/C Thompson J.M., CBE, DSO, DFC&Bar, AFC, F/Lt Hruby Otakar DFC, S/L Mansfeld Miroslav DSO, DFC,AFC. Identified by Mr Jaroslav Popelka.